Established in the year 2004, we, Filtek India Pvt. Ltd. are an ISO 9001:2008 Certified Company, engaged as one of the leading manufacturers and exporters of Centrifuge, Hydraulic Filtration, FilterMag, Filter Minder, Bilgekleen, Diesel Conditioning System. Apart from this, we are also offering OEM fitment options or full retrofit kits like full retrofit kits and industrial retrofit kits to ensure that our clients attain highest level of client satisfaction. Our company has a well developed manufacturing facility based in Pune (Maharashtra), which is equipped with machines such as centrifuge test jig and oil leakage test jig to enable smooth production. Further, our quality controllers test the range on well defined parameters such as filtration capacity, dirt holding capacity and performance. 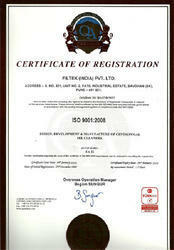 This makes sure that our range is at par with international quality standards. Moreover our wide sales & distribution network, enables us to deliver our range within a given time frame. We endeavor to attain our final objective of client satisfaction by strong commitment to quality, focused technology adoption, high attention to safety measures, stress on value addition and deep understanding of customer needs. Some of the renowned names that we are serving are Indian Railways, Greaves, Perkins and Renault. Our well-developed R&D unit facilitates us in meeting the changing market trends and in offering a wide range of Centrifuge Oil Filters & innovative products & introducing complimentary products and offerings. Hydraulic Filtration Systems, Air/Fuel Filters, Bilgekleen Coalescers, and Oil Filter Magnets. Further, our R & D experts work in close coordination with our production managers to assist them in manufacturing effective range of filters and filtration units. Furthermore, our personnel stay in touch with our clients in order to take customer feedback & take corrective action. Certificate of Appreciation Awarded to Filtek India Pvt. 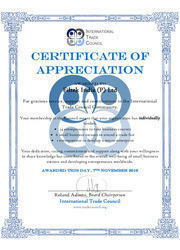 Ltd. for gracious service, support and contributions to the International Trade Counsil Community. We are engaged in manufacturing, supplying and exporting of a wide range of centrifuge oil filters/cleaners in varying models, hydraulic filtration systems, air/fuel filters, bilgekleen coalescers, and oil filter magnets. Manufactured utilizing high grade raw material such as aluminum and steel, these are extensively used in the production process of diesel engines, diesel generators, wire drawings and industrial machines like honing, grinding, & washing. Apart from standard options, we are also capable of offering these with customized solutions to meet the varied requirements of our clients. We are continuously progressing under our MD, Mr. B. K. Patwardhan, who has an industry experience of 25 years. Owing to his business acumen and years of experience, we are able to build cordial business relationships with our esteemed clients. Our mission is to provide "High quality, practical and reliable filtration solutions", via a team of dedicated professionals with over many years experience in manufacturing, sales and retrofitting of centrifugal by-pass filters.